'They are not for you but for a later age!' Ludwig van Beethoven, on the Opus 59 quartetsBeethoven's sixteen string quartets are some of the most extraordinary and challenging pieces of music ever written. They have inspired artists of all kinds - not only musicians - and have been subject to endless reinterpretation. What does it feel like to be a musician taking on these iconic works? And how do the four string players who make up a quartet interact, both musically and personally?The Takacs is one of the world's pre-eminent string quartets. Performances of Beethoven have shaped their work together for over forty years. Using the history of both the Takacs Quartet and the Beethoven quartets as the backbone to his story, Edward Dusinberre, first violinist of the Takacs since 1993, recounts the exhilarating challenge of tackling these pieces. Beethoven for a Later Age takes the reader inside the daily life of a quartet, vividly showing the necessary creative tension between individual and group expression and how four people can enjoy making music together over a long period of time. The key, the author argues, is in balancing continuity with change and experimentation - a theme that lies at the heart of Beethoven's remarkable compositions. No other composer has posed so many questions about the form and emotional content of a string quartet, and come up with so many different answers. 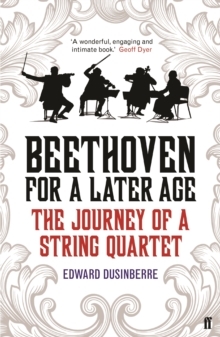 In an accessible style, suitable for novices and chamber music enthusiasts alike, Dusinberre illuminates the variety and inherent contradictions of Beethoven's quartets, composed against the turbulent backdrop of the Napoleonic Wars and their aftermath, and shows that engaging with this radical music continues to be as invigorating now as it was for its first performers and audiences.